You will often hear me talking about SharePoint Wikis. I am a big fan of collaboration by publishing and wikis. What does that mean? Well instead of creating managing a large number of documents, which require programs to open and edit, I rather use a Web Page to get my information across. In a previous article on using Wiki's when doing the SharePoint migration of a large documents, I mentioned that Web Pages could in some cases replace PDFs. Wiki Library: SharePoint offers the site owners the ability to manage content through a single or multiple Wiki page library in an existing site. This could be created in any SharePoint sites, regardless of the template used to create the SharePoint site. The library is just another library that adds functionality to link to other pages, content in lists or libraries as well as the lists and libraries themselves. This is great for managing a team site for example, the ability to quickly create pages, link them, and add web parts. But what if you want to turn your Wiki Library into an Enterprise Wiki? With an internal wiki library being properly used and consistently maintained with new content, there is the possibility that it becomes too big to control. In my experience, the biggest factor for using the Enterprise Wiki is the requirement for standardizing a look and feel and having metadata assigned to each page during its creation. The use of an Enterprise Wiki helps the Wiki owner have multiple content types and page layouts to better organize. The Enterprise Wiki works a lot like the publishing site where it allows you to define a content type to have your desired metadata. You can then create page layouts with your own content types and apply the design that you want to it. There will come a time where the simple Wiki Library will just not be enough for your needs. It will need to be migrated to an Enterprise Wiki. A Wiki page can contain web parts that refer to lists and libraries within its site. When you try to move these pages to another Site Collection, even another site, you will see errors on the page. SharePoint simply does not allow looking up lists/libraries across site collections without some kind of coding. Similar to the one above, it involves linking to the old Wiki Library. However, we copy or move the entire library to the Enterprise Wiki site. This will help users for linking to other pages and lists as they are in the same site at all times. The problem lies in actually copying the list and its content. A tool like Sharegate makes it easier copy lists and the content within. Manually, you would first need to make sure all pages don’t contain web parts for viewing lists within the site. Then you could use PowerShell or SPD to try and move the list over to the destination. Migrate your old Wiki Pages into new Enterprise Wiki Pages. This means taking the wiki page content and copying it in the “Page Content” field in most cases of an Enterprise Wiki page. This can be done manually, one by one but can take up a very long time. You need to make sure all hyperlinks to images, documents follow to the new url as well. Again, you could use a tool like Sharegate as it copies content, assigns properties like a new content type, and corrects the link. Perfect for this situation. Don’t forget, no matter which method you decide to go with, it’s important to block write access to the old Wiki to make sure no new pages get created there. Make sure your users understand what’s going on not to make them feel like they are forced the change, always helps with user adoption. 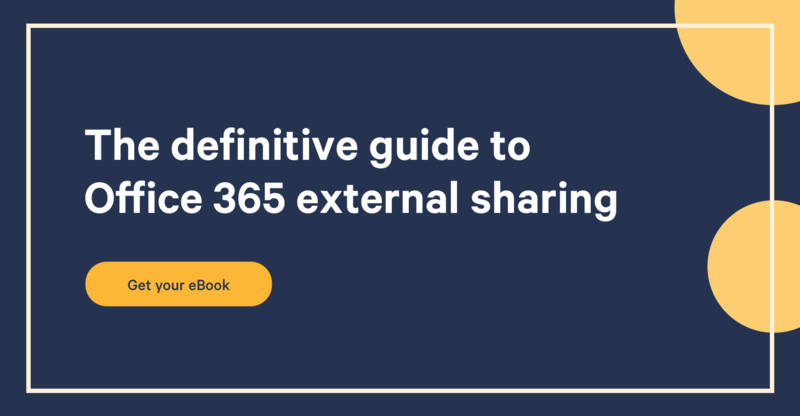 Learn more about external sharing and benefit from the full potential of your Office 365.